I was going through one of my school bags I took to San Diego, and found these!! Haha! This is Donna Staten...you may know her as the Art Ed Queen of Pinterest!!!! 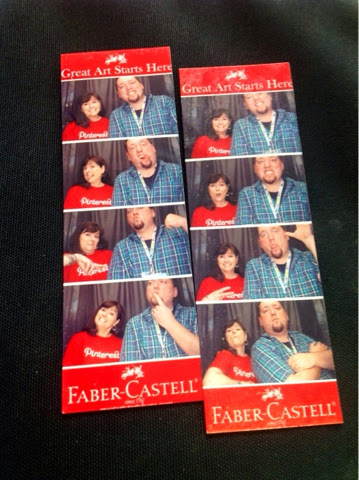 We were having a great time in Faber-Castell's Photo Booth!!! If you've never been to the National Convention...it is a whole lot of fun! You get to spend time with some great people too!!! Thanks for snappin' some pics with me Donna!!!!! Somehow I never made it into the photo booth! But I did get to spend a bunch of time with the awesome queen of Pinterest, Donna Staten, and am so glad I got to know her! Awww, thanks "E" and Phyl! The best part of the whole thing was meeting so many great peeps! We all speak the same language and just "get" each other! Let us know when Baby E gets here!! Awww....thanks Mr. E and Phyl- enjoyed my time with both of you! Meeting with great peeps was the best part to me. Let us know when Baby E gets here! Jealous you got to do this!!! I free lance with Faber-Castell's other division and know Christa who was there! She is an amazing person and lots of fun! Glad you had fun!